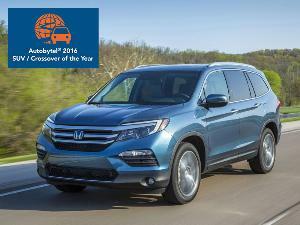 2016 Top Pick for Parents – And it Isn’t a Minivan! Okay, you good mommies and daddies, you who pledge to do anything to protect your children, we recommend you delay the purchase of your next family car until you read why we've chosen the 2016 Volvo XC90 as our Top Pick for Parents. First, however, let’s recognize that elephantine dollar sign in the room: The redesigned Volvo XC90 is not cheap. The base price for the XC90 T5 with front-wheel drive is $44,945, and that’s before you add any options, like metallic paint, or heated front seats, or a blind spot warning system. Oh, you wanted seating for seven people? That brings the price tag to $53,155, at a minimum. No, the new Volvo XC90, which earned Autobytel's nod as the best Luxury SUV/Crossover of the Year, is not the most affordable way to transport a family. But, if you have the means, the 2016 XC90 is an excellent pick — in fact, it's our number one pick — for parents looking to shuttle loved ones safely and securely in style, comfort, and luxury. Let’s take a closer look at the 2016 Volvo XC90. Volvo uses five times the amount of ultra high-strength steel in the new XC90 that was employed in the original XC90. By Volvo’s measurement, that translates to 40 percent of the 2016 XC90’s total body weight. 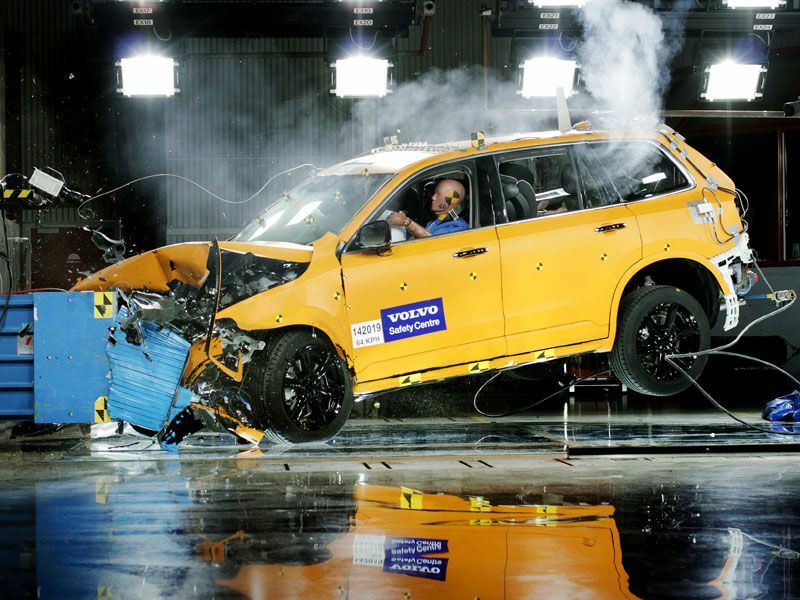 As a result of the XC90’s robust engineering, the SUV earns top safety ratings in both Europe and the United States. 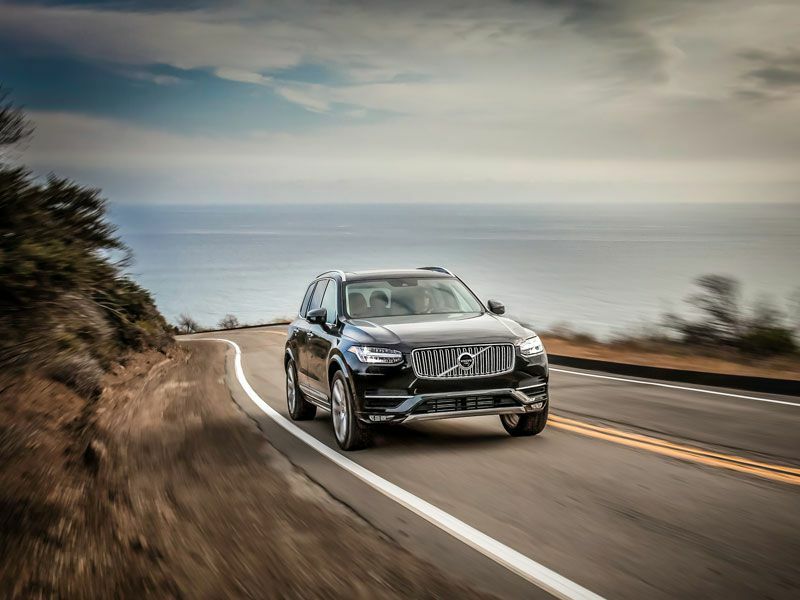 The Insurance Institute for Highway Safety (IIHS) gives the XC90 a “Top Safety Pick+” rating, while Europe’s New Car Assessment Program gives this new Volvo SUV a 5-star overall rating, the highest achievable level of safety. Only those vehicles that receive an “Advanced” or “Superior” rating associated with the effectiveness of their forward collision warning and automatic emergency braking systems are eligible for a “Top Safety Pick+” rating from the IIHS. In the case of the Volvo XC90, the SUV receives the highest possible “Superior” rating, reflecting outstanding performance by the vehicle’s City Safety technology. 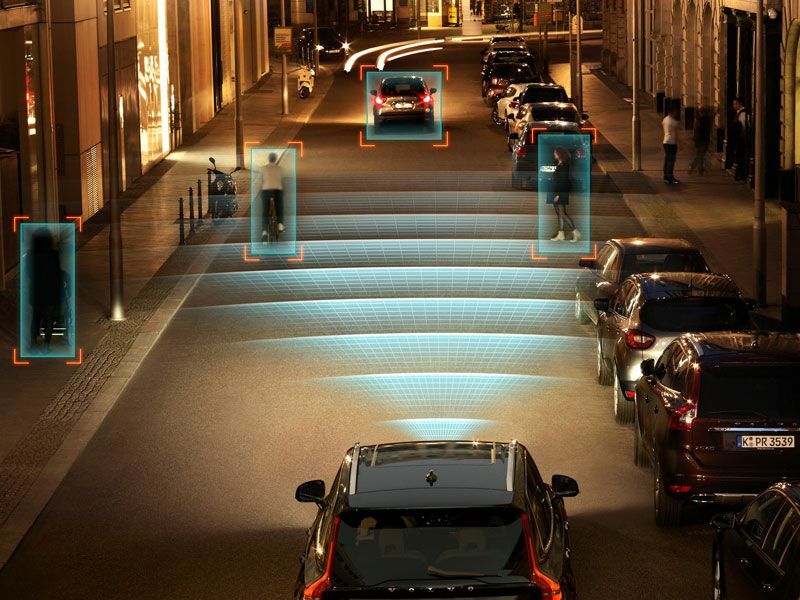 City Safety is the name that Volvo gives to its standard collection of collision avoidance technologies. They work day or night and are capable of identifying obstacles such as other vehicles, pedestrians, and cyclists. Should the XC90 determine that a collision is possible, or imminent, City Safety automatically activates the braking system in order to bring the SUV to a stop before an impact can occur, or to reduce vehicle speed as much as is possible prior to impact. With the introduction of the redesigned XC90, and as a part of the SUV’s standard City Safety system, Volvo debuts Braking in Intersection technology, which it claims is a “world-first” feature (the new Audi Q7 now offers this, too). Let’s say you’re sitting at an intersection, waiting to turn left. The light turns yellow. There is an oncoming vehicle, but you’re sure that driver will stop for the light. You start your turn only to discover that the other driver is seemingly oblivious to the meaning of a yellow traffic light. Braking in Intersection technology recognizes that the other vehicle is not slowing and automatically brings the XC90 to a halt, preventing the Volvo’s driver from turning left into the path of the oncoming vehicle. 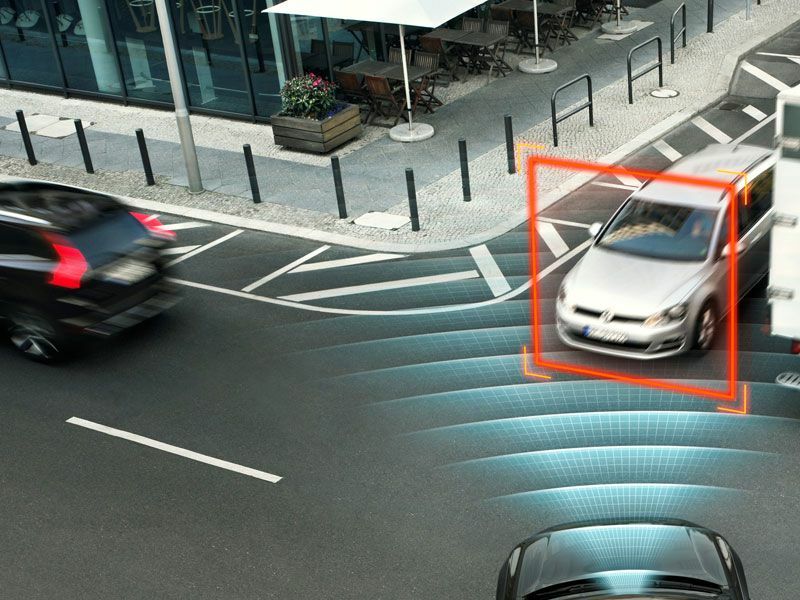 City Safety is a part of Volvo’s broader IntelliSafe suite of standard and optional driver assistance technologies. Among the IntelliSafe features, the XC90’s standard Run-Off Road Protection system could be the most important. Volvo’s research concludes that nearly half of all motorist fatalities in the United States result from single-vehicle road-departure accidents. The XC90’s standard Run-Off Road Protection system, which is a part of the SUV’s lane-departure warning system, is designed to prevent unintended road departure or to mitigate the potential effects of such a crash should it prove unavoidable. Additional highlights of Volvo’s IntelliSafe technologies include a Driver Alert Control with a Rest Stop Guidance function, which is designed to detect a drowsy or inattentive driver and then to recommend that he or she take a break. Options include a blind-spot warning system with rear cross-traffic alert and a Pilot Assist lane-keeping assist system that helps to center the XC90 in a lane. Every XC90 is equipped with energy-absorbing front seats that are designed to limit whiplash injury in certain types of collisions. Additionally, the SUV’s seat belts automatically tighten to secure occupants in advance of a collision, as determined by the various detection systems. 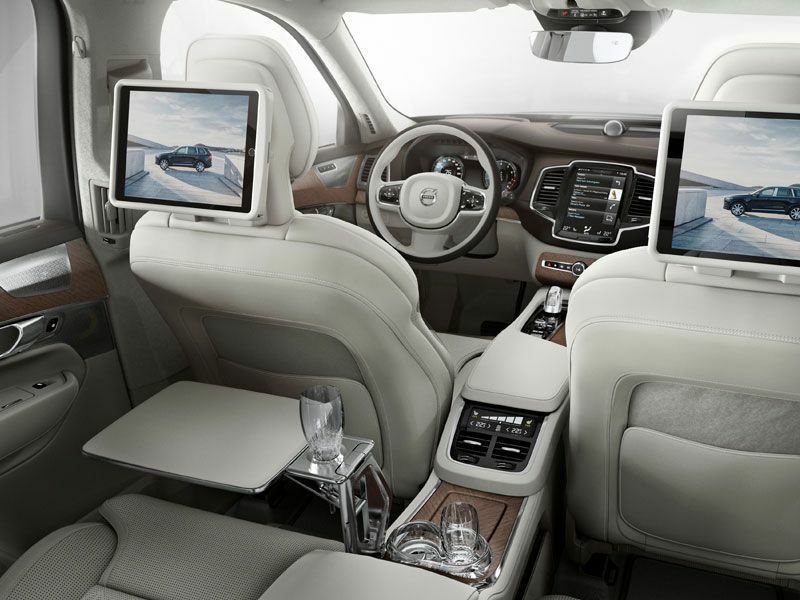 In standard format, the XC90 seats five passengers. Third-row seating is available, as is an integrated child seat booster cushion for the second-row seating. Volvo dealers also sell an accessory booster cushion and adjustable backrest, constructed using impact-absorbent material and designed for a child’s use until the age of 10. Note that the XC90’s Lower Anchors and Tethers for Children (LATCH) system earns an “Acceptable” rather than a “Good” rating from the Insurance Institute for Highway Safety. This rating applies to how easy they are to use properly and is not a reflection of their effectiveness when used as directed. Benefits of Volvo XC90 ownership amount to more than just safety. As is expected of any luxury SUV, the XC90 is equipped with numerous comfort and convenience features, either as standard equipment or as options. 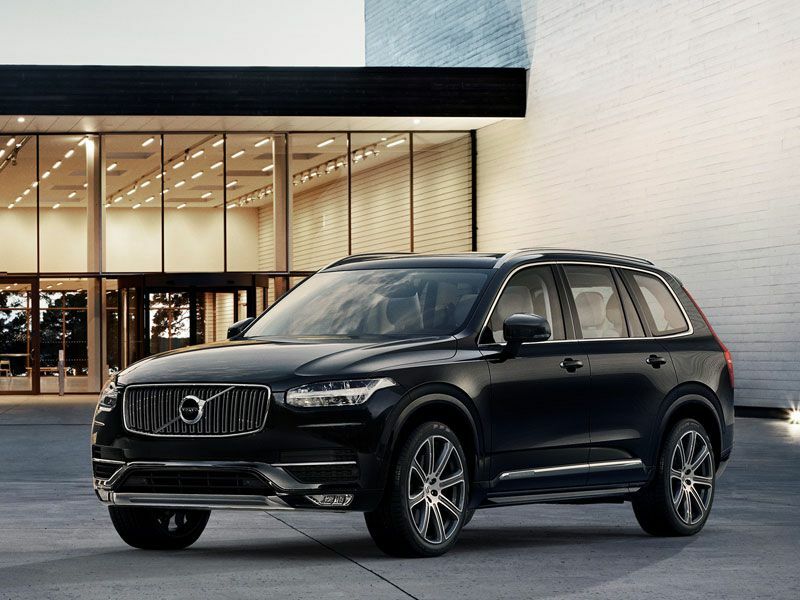 Buyers select from Momentum, Inscription, and R-Design trim packages and then tailor the XC90’s appearance through a range of paint, interior trim, and leather color choices. 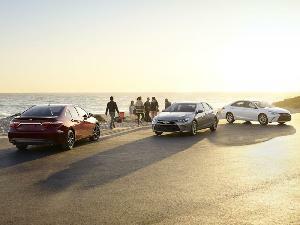 Three powertrains are offered, too, ranging from a turbocharged four-cylinder (T5) to a turbocharged and supercharged four-cylinder (T6), and a plug-in hybrid variant (T8). Scandinavian design principles permeate the XC90. From the signature “Thor’s Hammer” front lighting, which Volvo plans to add to all of its future models, to its minimalistic interior design and fittings, tasteful understatement characterizes the redesigned XC90. 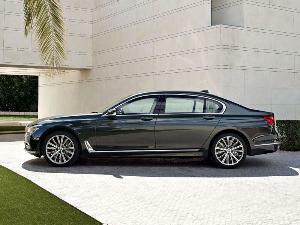 Better, the front seats are offered with heating, ventilation, and massage functions to ensure maximum comfort. A four-way power adjustable lumbar support makes long journeys effortless. A technological marvel, the Volvo XC90 supplies numerous convenience and infotainment systems that make ownership more enjoyable. 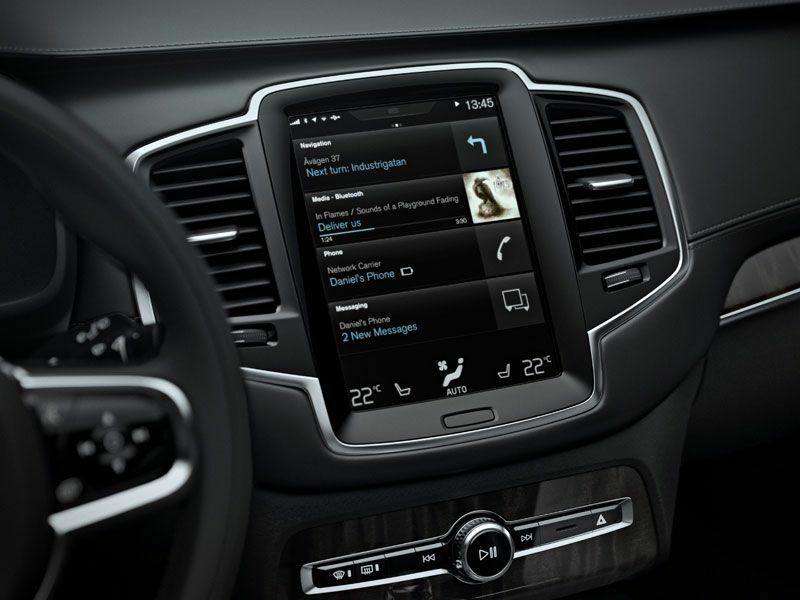 Perhaps the most obvious example is the standard Sensus infotainment system, which employs a large, 9-inch touchscreen display in a vertical, portrait-style position similar to a tablet computer. Equipped with navigation, real-time traffic information, and natural voice-recognition technology including voice texting capability, the infotainment system includes a free six-month subscription to Sensus Connect services and supports Apple CarPlay smartphone projection technology. Designed to replicate the listening experience within the Gothenburg, Sweden, concert hall, an optional Bowers & Wilkins sound system uses 19 speakers to satisfy almost any audiophile. The XC90’s climate control system features CleanZone air purification, and this Volvo also can be fitted with a heads-up display, a 360-degree camera view system, and Park Assist Pilot, which can autonomously steer the XC90 into a parallel or perpendicular parking space while the driver operates the pedals and transmission. When you have kids, you need a vehicle that can carry things, whether it’s a new big-girl bed taken home from the local IKEA, your son’s hockey or soccer equipment, or luggage for a family road trip, and the 2016 Volvo XC90 provides commodious cargo space. If you opt for the third-row seat and use it, the trunk is small, accessed through the hands-free power rear liftgate and measuring just 15.8 cu.-ft. However, fold the third-row seat down and it expands capacity to 41.8 cu.-ft., which is on par with other midsize crossover suvs. Every XC90 has a second row of seating comprised of three individual chairs that independently recline or fold. 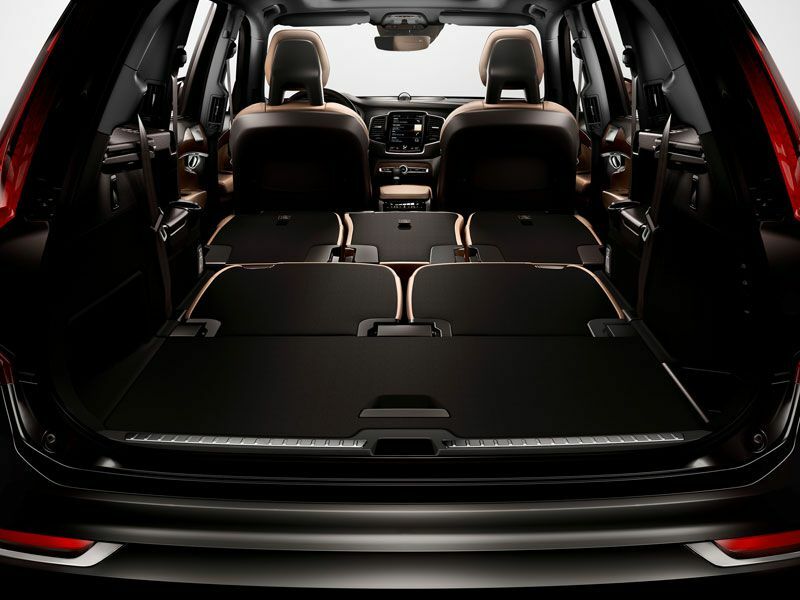 Tuck each of them away, and the XC90 supplies a maximum of 85.7 cu.-ft. of cargo capacity, a generous amount of space. 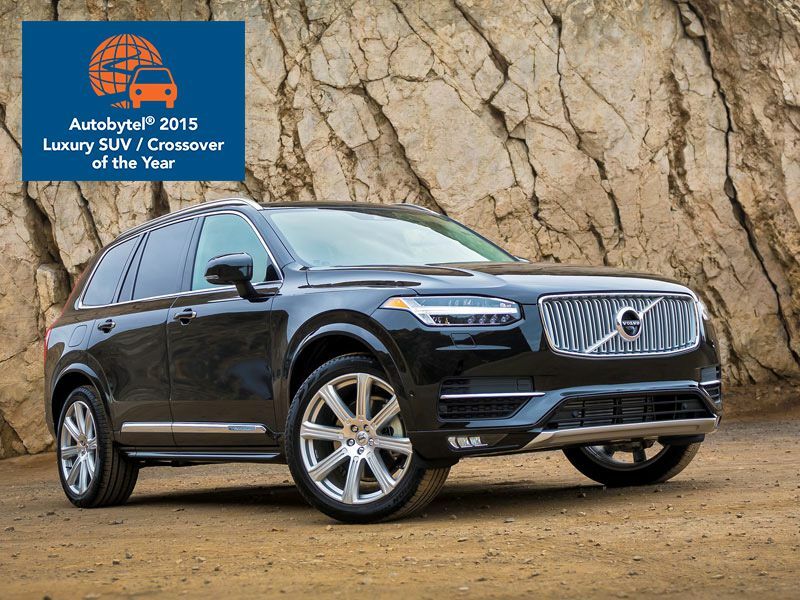 Based on our editorial staff’s evaluations and opinions, the redesigned 2016 Volvo XC90 is the best luxury SUV/crossover of the year. 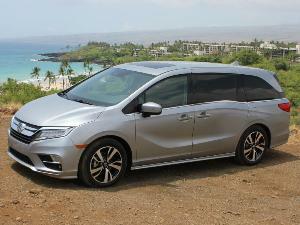 It looks terrific, inside and out, and is both roomy and comfortable. A variety of engines, trim packages, colors, and options provide the ability to tailor an XC90 with specific preferences, not to forget that this Volvo is a technologically sophisticated automobile. It might cost more than you were perhaps planning to spend, but the substance found within the Volvo XC90 is worth the premium, especially in consideration of the XC90’s ability to protect the people you love the most.